My husband and I went to a concert with some friends last night. For us, the evening meant the last concert of the summer and a chance to enjoy a perfect night, a yummy picnic, and Alan Jackson. Yes, we do still live in the ‘80s. Anyway, after our picnic we headed to our seats, anticipating all sorts of toe-tapping and two-stepping. We settled in. Great seats. Happy campers. Sorry, honey, I’m not trading seats with you because the woman in front of me was probably about four feet tall, I’m not even exaggerating. I looked at the guy in front of us, and the first thing I noticed was that he and his wife were smiling. Huge. They were laughing like kids and saying things like, “These are really good seats!” and “I’m so excited! This is going to be great!” They seemed almost giddy to be there. I took notice because who is really like that? The concert started and that’s when the fun really began. You would think this guy had won the lottery for life. He was clapping, jumping up out of his seat, nodding his head, sometimes lost in his own little world of music. And his wife was the same—pure, unadulterated joy at being at just that place at just that time. They got up and danced—a lot—which then made us get out of our seats and do something that sort of looked like moving to the rhythm but might not be called dancing. Only because B couldn’t see through the guy and if you can’t beat ‘em (or see over them) you might as well join ‘em. But you know what? That made the concert more fun. And soon all the people around us were dancing and singing to lyrics we haven’t sung in YEARS. And it made me realize that pure, unadulterated joy is missing from my life. Oh sure, I am joyful. I’ve got the joy, joy, joy. But that childlike bliss. That’s something different. It’s like the kind you used to feel when you were a kid and your mom let you go outside on a rainy day and splash in the puddles in your pajamas and rain boots with no umbrella. You’d jump and jump and make all kinds of ruckus just because you could. And finally you’d be wet to the skin, laughing so hard because you just did that wonderful thing in your pajamas with the rain coming down. I sensed that this guy, whoever he was, lived like this every day. That every day is a new experience to be had. That every experience was an opportunity for wonder. That every moment a chance to be filled with a glorious expression of awe at even being able to be a part of it all. This man’s sense of joy and wonder was contagious. His friends seemed genuinely happy to be there. We actually got up out of our seats and danced. The people around us did too. All because this guy—a grownup, adult man—was just. so. happy. Can you imagine how he approaches his work each day? Yea! I get to go sit in a cubicle and crunch numbers for eight hours without talking to another human being. But I get to take a 15 minute break and a 30 minute lunch, which will be awesome. I will get to solve problems and handle difficult employees, too. And then tomorrow I get to do it all over again! What a fantastic life! And, of course, it got me to thinking. What if I lived like that? What if I approached my day with that kind of attitude? Like, this is going to be so awesome, man! I wonder if it would make the bigger obstacles seem just a little smaller and the small problems seems tiny. I wonder if every negative thought could be reduced by even a small percentage just because I approached life with a sense of wonder, awe, excitement even. Because here’s the thing: as Christians, we have everything to be amazed about, everything to be thrilled about, everything to be downright giddy about. We are free to get up and dance and to live these lives we’ve been given with unabashed glee. Of all people, we should be rockin’ that jukebox (sorry, Alan) and throwing caution to the wind. So today (and hopefully longer) I’ll be thinking about the Alan Jackson-loving man, giddy with excitement and thrilled to be in the moment. 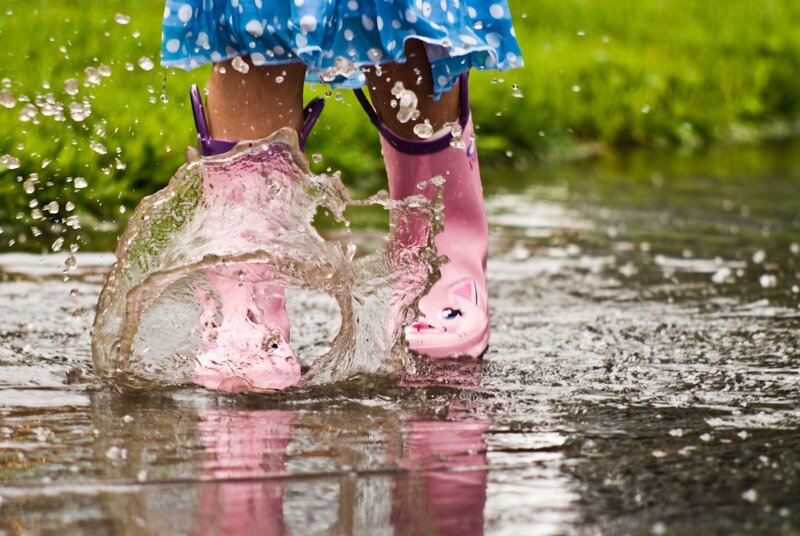 And maybe, just a little more often, I’ll try to live my life like I’m jumping the heck out of the puddles. That is hilarious. And how true is it that Christians of all people should live every day with joy? Running gives me that joy. Sometimes I am singing as I run, with my hands in the air praising God. I might look like a fool. But I don't care. I wish I could approach every aspect of my life like that. I'm glad you had fun! I can just see you running and worshipping without a care. I love that, Jo-Lynne! I love this post, Shelly!!! Very very true. Life is so short . . . and I'm reminded of that more and more every single day. So here I am, 51 years old, and trying to REALLY LIVE MY LIFE. I want to be joyful. I want to be encouraging. I want others to see JOY in me so they see MY SAVIOR in me. A couple of weeks ago my husband and I went to see Def Leppard (yes, 80s people here too) and it was PRICELESS! We did the same, laughed and sang the lyrics of old songs and stood up and yelled and tried to dance. I felt like I teenager again, and I had that same thought driving home. Why don't I live every day of my life like this??? So let's do it. Let's live life with a joy that comes from knowing that whatever comes our way, God's got it taken care of. We know how the story ends. We've read the last Book of the Word so we know our eternity is secure. Tonight I'm taking my dad to a St. Louis Cardinals baseball game. I'm gonna stand up and cheer and make a fool of myself and I don't care what anybody else thinks. My dad and I never do anything just the two of us (my mom isn't a baseball fan so she isn't going) so I'm going to make the most of the time together! Blessings to you Shelly!! And prayers for you and your family today! Thank you so much for sharing. I appreciate you!!! Oh Robbin, you are always so kind. And so encouraging. Thank you! Hope you had fun at the game! What a great idea.